Molana Syed Jawad Hussain Abidi is well known in Karachi Pakistan. He is establishing his own website where his lectures will be available with topics of the speech. Molana Jawad Abidi belongs from a famous religious family of Sadat of Nowgawan, Amroha, India. His grandfather Syed Sulaman Abidi was a renowned Marsyia Khwan. Brought up in the religious family of Sadat, he had developed ambition for the study of religious books and involvement in Majalis e Aza and Milad events in which he also regularly participated as a Zakir and a young speaker. He was greatly influenced by his father Syed Kausar Hussain Abidi who had travelled around the world and had amassed a great knowledge of Multiculturalism and multi faiths. Perceiving his bent of mind, the young Abidi was enrolled in a renowned religious education institution “Quran O Itrat Academy in Karachi after finishing his academic education. 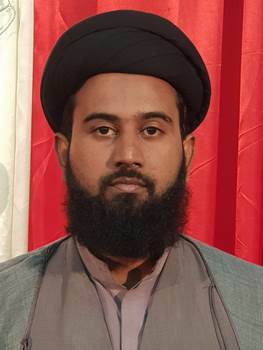 The academy has now more than 100 students was started in 1995 with its Principal Ali Raza Mahdivi, has produced many notable Ulema and Khateeb. For the last 10 years, Molana Abidi has been delivering Majalis far and wide in Pakistan. In 2014 and 2015 he travelled to United Arab Emirates for Muharram Majalis and addressed in many cities. He has been regular contributor to various Pakistani TV channels including Ahlulbait TV. His special interests are in Islamic history, Comparative study of religions and Islamic jurisprudence. Molana Syed Jawad Hussain Abidi has been invites this year by “Alamdar Association” for Darus/Majalis in Ramadan in its centre at 419 Blaxcell Street Granville Sydney (formally known MWA). The Daily programme starts with Maghreb prayer, Iftar, dua-e- iftitah and brief speech of the guest speaker Molana Abidi.